P2P insurance is not a new concept, but P2P providers use new approaches to deliver a “back to the roots” insurance experience. Boston, March 24, 2016 – Peer-to-peer insurance is a return to insurance’s roots: a small group of people pooling resources to cover losses sustained by someone in the group. P2P providers have developed several coverage options, but regardless of the model or the provider’s focus, all of these providers are trying to remove overhead insurance costs and pass the savings to consumers. While the concept isn’t new and the premise might be basic, traditional insurers would do well to pay attention. This Impact Report examines how P2P insurance works, the rise of P2P insurance providers from around the world, and the various go-to-market models employed by these providers: Besure, CycleSyndicate, Friendsurance, Hey Guevara, Inspeer, insureapeer, jointly, KarmaCoverage, Lemonade, PeerCover, Riovic, and so-sure. It is based on 10 Aite Group interviews conducted between February 2016 and March 2016 with industry leaders involved with P2P insurance. This 34-page Impact Report contains three figures and two tables, and it mentions Aleph, Allied Peers, Allstate, AlphaCode, BPIFrance, Broodfunds, CommonEasy, DeductibleShield, Everest, Gaggel, Gather, Glow, Hiscox, ile de France, La French Tech, Ledger, Liberty Mutual, Lloyd’s of London, Munich RE, National Indemnity, Nationwide, Sequoia, Tong Ju Bao, Transatlantic RE, Uvamo, WorldCover, WeSura, and XL Catlin, Zero. 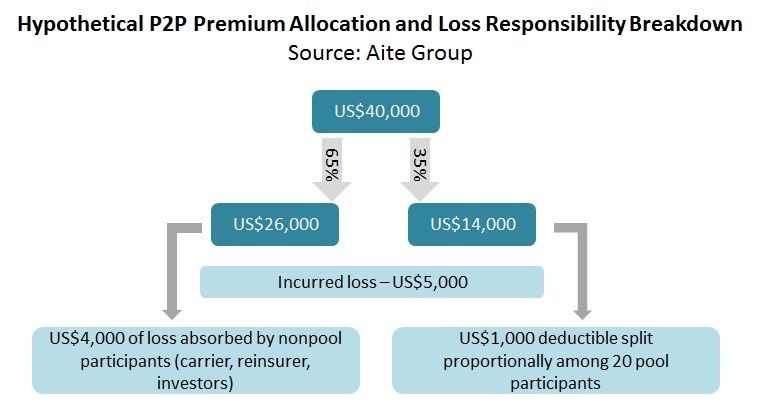 Clients of Aite Group’s P&C Insurance service can download this report.